Have you ever been flat-out lied to by a customer service rep? One time in particular is very vivid in my memory. When I was 21, I got sick at a crucial moment when my health insurance was in flux. I knew that most of my expenses would be covered as long as I finished the application by the 30-day deadline, but I wasn't sure which forms I had to fill out to complete it in time. The clock was ticking, I was sick and broke, and if I made one misstep I would end up thousands of dollars in debt. Dealing with them was like trying to find the center of a labyrinth. I asked one rep what I needed to fill out in order to finish, and she requested my information over the phone, promising me she would send me a pre-filled form to sign and send back. The page arrived looking like it had intentionally been filled out wrong. My father's name was where my name should be, and my address and date of birth were completely garbled. I called back, and another rep informed me that it was the wrong form altogether and he'd send me the right one immediately. After three days, the form did not arrive. I called back and couldn't reach anyone who could give me an answer. I spent that entire day on hold, being bounced around from department to department. The hold was OK- I was sick in bed and didn't have anything else to do- but I felt so disheartened, frustrated, and intimidated. Then I realized it: they were messing with me on purpose! Thousands of dollars were at stake for them too, so their company would benefit if I missed the deadline. They had zero incentive to give me good information. It was a wild goose chase, and it was intentional. Of course, not all experiences are as malicious as the one I just described. Sometimes, the customer service rep just don't care. After all, they're not paid nearly enough to put up with the people they call all day. They'll tell you anything to get you off their back, as long as it won't put their job at risk. "Hello, my name is So and So and I'm calling to get some information on my XYZ account. Just to let you know, I may be recording this phone call." 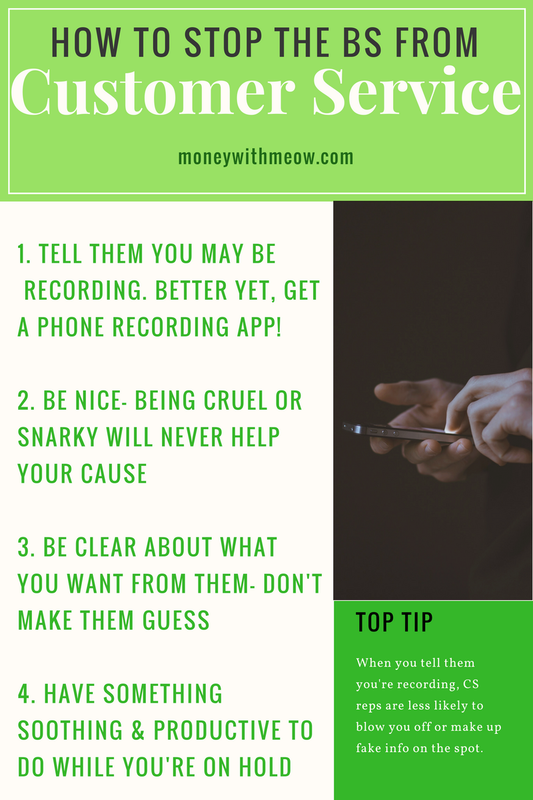 Even if you aren't recording, it doesn't hurt to say that you might be. This is usually enough to alert a rep into not feeding you BS. You don't have to actually record the call, but it really helps in case someone leads you astray out of their own ignorance. Phone recorder apps exist, and I recommend using one. Keep in mind that in many states, you have to inform the other person if you are recording the phone call, so always mention it! Don't keep the rep waiting while you dig up your account number or other information. Have everything ready before you dial, including all relevant paperwork, numbers, and identification. Be clear about how you want them to help you. Don't make your rep guess about what your desired outcome is for the call. If you're calling to get a refund, tell them that's what you'd like. If you're looking for a particular piece of info, the lowest price, or to be put on a payment plan, be upfront and ask them how you can get there. I call the IRS a couple times a year, and they usually keep me on hold for an hour and a half. I like to put the phone on speaker and use that time to wash some dishes, fold some laundry, and play some video games. I recommend something soothing yet productive, so you don't feel like your time has been wasted. I shouldn't have to tell you to be nice! Being cruel or snarky to Customer Service reps just makes them want to see you fail. I always smile when I talk on the phone. It seems silly, but people can hear subtle changes in your voice if you are smiling. Remember the goal: it's to get good service, not to use this stranger as a whipping boy for the sins of their employer. Also keep in mind that the customer service rep doesn't care if the company loses your business, so threatening things like "I'll never shop at your store again!!" is really not concerning to them. Instead, say, "I had this problem with your store, is there any way you can help me make this right?" Most people want to think of themselves as good people who will help other good people in need. Even better, humans (just like ants) are hardwired to want to help members of our own group or tribe. If you appeal to this trait when you're on the phone with a CS rep, you're more likely to get good help. Cheerfully use their name when talking to them, and use the word "we" if you can. 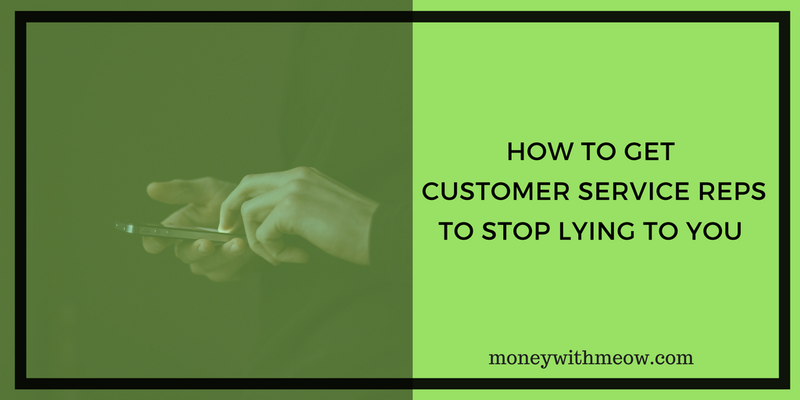 Armed with these tips, you should be able to navigate the hellish waters of customer service a little more easily. Got any tips of your own? 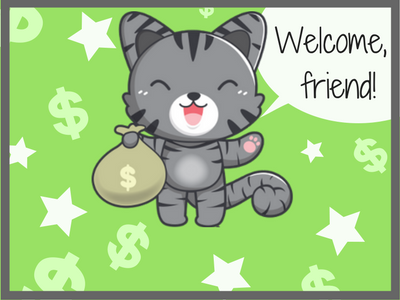 Write me a comment or tweet at me @moneywithmeow! These are amazing tips! I once called the IRS and never wanted to call them back again. I also had a bad experience with Comcast. Amazon has the best customer service I've known all my life!